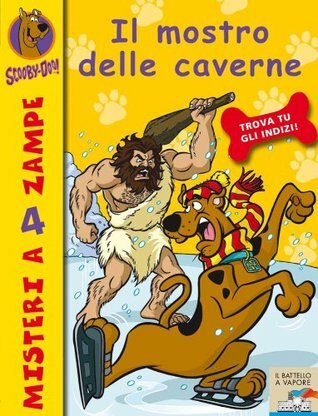 Another generic Scooby Doo tale. Scooby and The Gang are on the case once again after Olympic figure skater Betty Kunkle’s silver skates disappear. In yet another whodunit mystery, The Gang stumbles upon what appears to be a prehistoric criminal; a caveman! Gelsey does a great job of creating a classically structured Scooby Doo mystery that’s accessible for young readers. While not as complex a crime as some of the others within the Scooby-Doo mysteries series, the book offers enough challenge to keep young readers engaged. However, the book may not hold the interest of fans or avid readers.The illustrations by Duendes del Sur do a wonderful job of capturing the charm, simple colors and bold lines of the Hannah Barbara animations. There are seldom any artistic differences between the characters and their television counterparts (besides vivid colors that come along with digital art), and the use of solid colors and misshapen borders adds flare to the character portraits and various scenes scattered throughout the book. They do a wonderful job of adding to the story without distracting from the text, and do the original designs justice.Overall, this is a great read for basic readers just starting to delve into chapter books, but might not intriguing for those who’ve long since moved on from reading picture books. We love all things Scooby-Doo, so whenever we find a Scooby-Doo book we haven't read yet at our local library, we just have to borrow it. The stories in the Scooby-Doo! Mysteries series are simple, fun, and we typically enjoy reading them together. Right now, our girls really like these short chapter books, but they also like the shorter picture books too. We've read so many of these stories I've lost count, but there are so many more out there...I think we'll be having fun with these stories for years to come.This story is rather simple and involves Daphne getting a chance to skate with a famous Olympic figure skater. Our youngest got too impatient for me to read this one aloud, so she read it independently. It was a quick read and we both enjoyed getting a Scooby fix. Mommy's review from 10/28/11 - This wasn't one of my favorite Scoody-Doo mysteries but it's definitely worth reading for any Scooby fan. I really like that all of the Mystery books and all of the Collect-the-Clues books are about the same length because we have a bedtime routine with these books and it always works out well.This one was slightly easier to figure out than some others - Julia had this figured out by the time the suspects were all known.We started Scooby-Doo! and the Groovy Ghost last night and we have Scooby-Doo! and the Haunted Castle waiting for after that. Another case of someone slapping a favorite children's character on the cover of a book and hoping it will sell. A weak story and nothing my avid reader finds engaging.